Sergio Marchionne at the opening of Chrysler House in downtown Detroit. A private memorial service Thursday at FCA US headquarters in Auburn Hills, Mich., honored the automaker's late CEO, Sergio Marchionne, on the same stage where he stood in 2009 and addressed Chrysler employees for the first time after leading the company out of bankruptcy. The one-hour service in the multistory atrium of the FCA technology center saw thousands of employees standing around each ring, watching emotional speeches from John Elkann, chairman of Fiat Chrysler Automobiles, and Marchionne's successor, Mike Manley. Marchionne, 66, died July 25 in Zurich, Switzerland. A public memorial service was held Sept. 14 in Turin. "I was lucky enough to become part of his world nine years ago. The years since then have been the most intense, absorbing and engaging of my life," said Manley, clad in a dark suit and tie. "I've said publicly that working with Sergio was a business education that you could not buy, regardless of how much you wanted to spend. But what I did not say publicly was that, for me, it was also a journey of personal growth. He gave me the space to understand who I am, and he pushed me to explore my full potential." FCA said plant managers from 25 FCA manufacturing sites attended the memorial. In Marchionne's honor, the company renamed its scholarship program, previously called the FCA Student Achievement Awards, the Sergio Marchionne Student Achievement Awards. 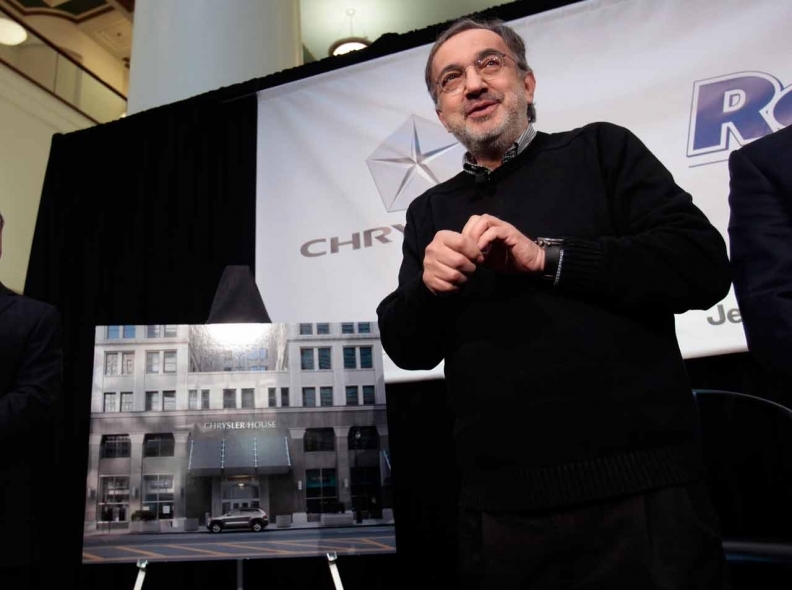 In mid-2009, Marchionne had stood behind a lectern in the same location to deliver a message of hope and confidence to Chrysler employees who had survived its ill-fated ownership under Daimler and Cerberus, as well as its 2009 bankruptcy. Elkann, who choked up speaking of the man he looked to as a mentor and friend for more than 14 years, described Marchionne as decisive, but with a higher purpose. "He taught us to think different, to have the courage to change and act, to be unafraid. He taught us that the most important question to ask ourselves, at the end of every day, is whether we have been able to change something for the better," Elkann said. "And Sergio did so, wherever his work took him, and in the lives of so many people." Elkann also used the opportunity to give a full-throated endorsement of Manley and his confidence to deliver on the five-year business plan Marchionne and Manley laid out to investors on June 1 in Italy. "Our future was presented on June 1 in Balocco. It represents the collective ambitions of the men and women of FCA, which we will build not just on high standards, but as Sergio would put it, on 'sky high' standards. Which is exactly how Mike Manley thinks and acts. He has already proved it, with his incredible track record of accomplishments. Mike has the board's and my full support, and I'm sure that, with the contribution of each and every one of you, by living our culture, we will continue to reach higher levels of performances, which is what really mattered to Sergio," Elkann said. "The pursuit of excellence, the idea that there is always a better way. He set us a powerful example, though his humanity, his determination never to accept the status quo, never to be satisfied with 'good enough,' and never with settling for mediocrity. As we come to an end to this memorial of who, to me, was a true friend, and who I miss very much, I hope we can all find some comfort in knowing that his example is something that we will continue to carry with us."